A galvanised steel sheet sheet covered the doorway into the base of the lighthouse. 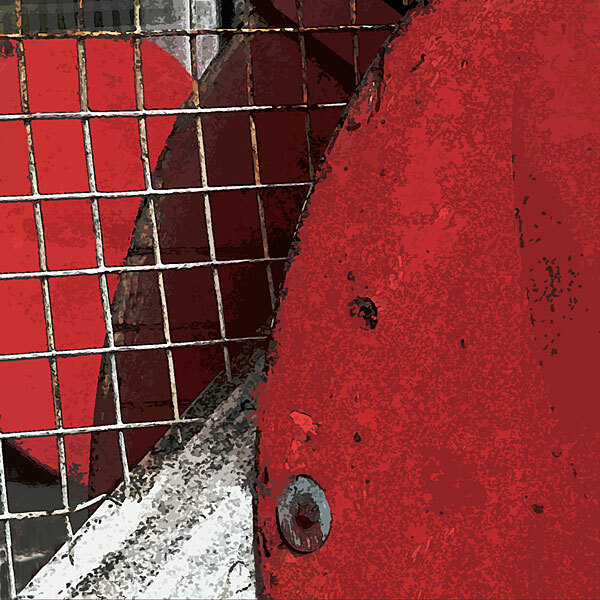 Salt laden air had cut through to the underlying steel and a red bloom of rust was spreading across the blue-grey zinc. In Chicago, the Leo Burnet Building stands in a long line of towers on Wacker Drive North fronting the Chicago River. This postmodernist design is by Kevin Roche – John Dinkeloo & Associates with Shaw & Associates and was completed in 1989. 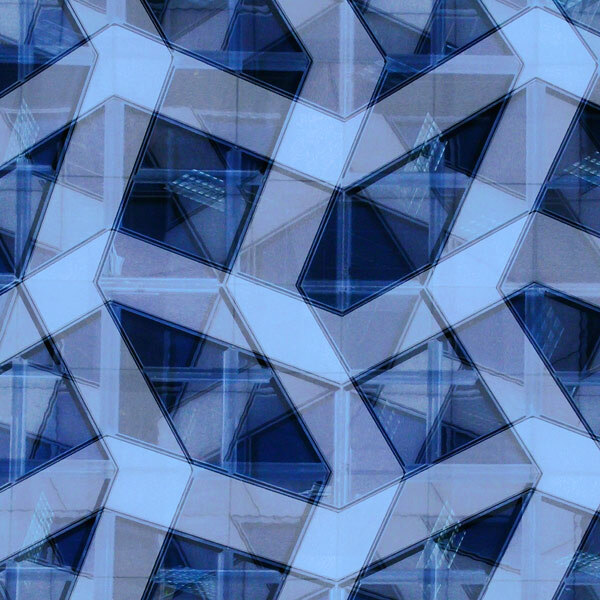 The grid of grey-blue granite blocks of the main structure is evident in this layered collage. 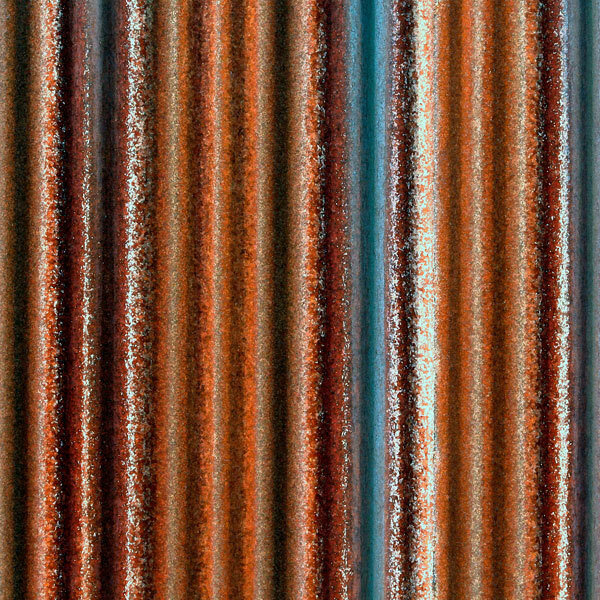 This is based on a photograph from a series contributing to the CORRUGATED IRON gallery.The image centres on the colours of the rusting metal and its linear symmetry. 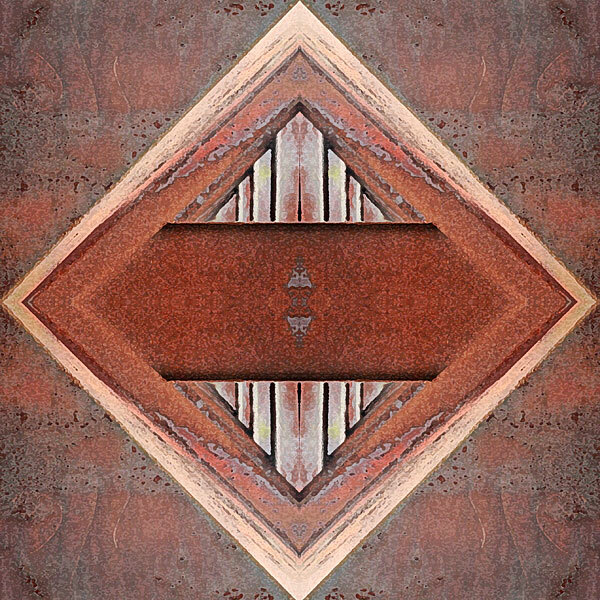 I extended this symmetry into the square format and the four mirrored quarters of the composition. The Standard Life House in Edinburgh was designed by the Michael Laird Partnership as part of the Exchange development on Lothian Road. 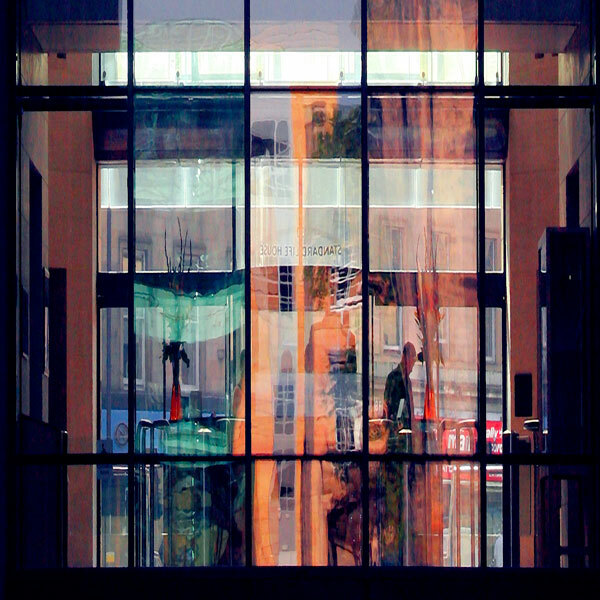 This stylised view against the early morning sun was taken from a public walkway threading under the building. 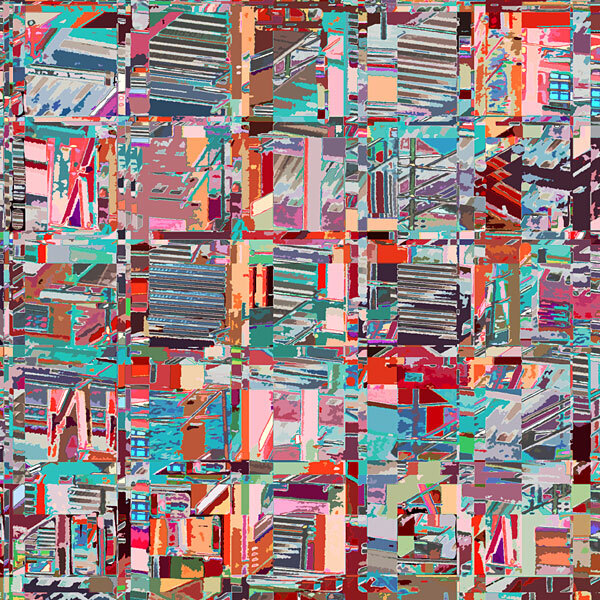 This abstraction is a combination of fragments from photographs of the BALTIC Centre for Contemporary Art in Gateshead where a lettered banner advertising an exhibition was suspended on the river facade. Photographs of the building itself will be added in future Galleries. I photographed some fragments of lettering at the entrance to the Waygood Gallery in Newcastle. I used them to play around with line, shape and colour to destroy legibility, at the same time thinking of the frustration of not being able to read one's own language let alone one that is foreign. 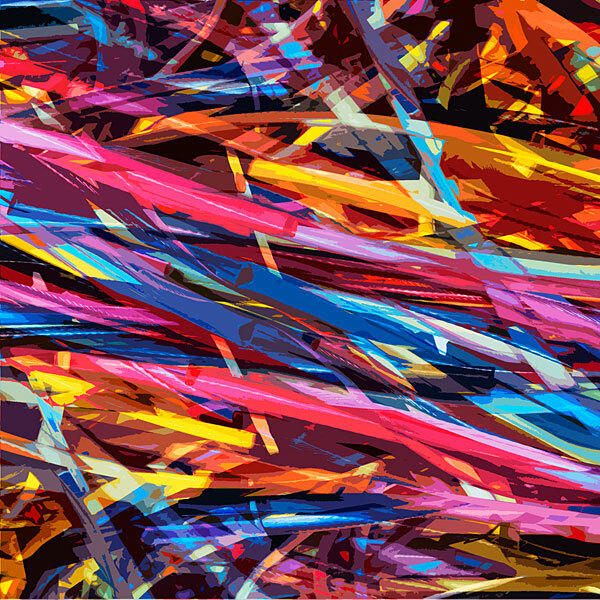 A series of rather brightly coloured images emerged. 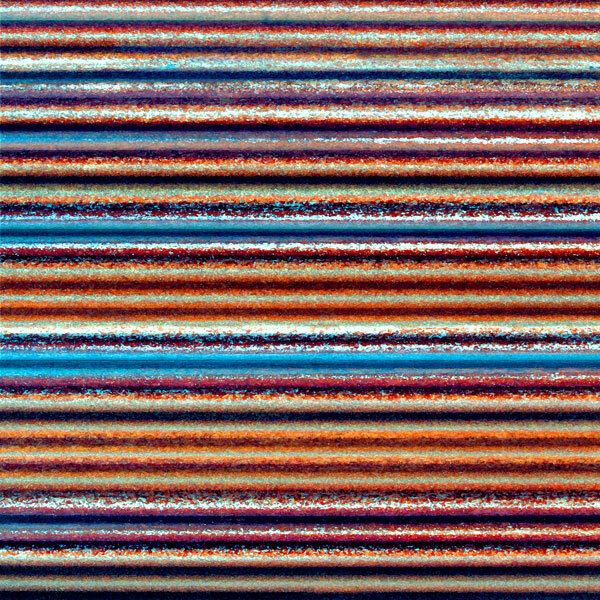 This is from a small series of abstraction derived from some of the first digital photographs I took using a borrowed Sony camera in 2003. I was recording the construction of the overall roof to the SAGE Gateshead, designed by Foster & Partners and completed in 2004. See ARCHITECTURE 1 for some of those early images. Some of the oldest surviving buildings in Newcastle are located on the quayside around the Guildhall. A few are venerable half-timbered structures built as warehouses and still fulfilling that purpose or finding new lives after conversion to other usage. 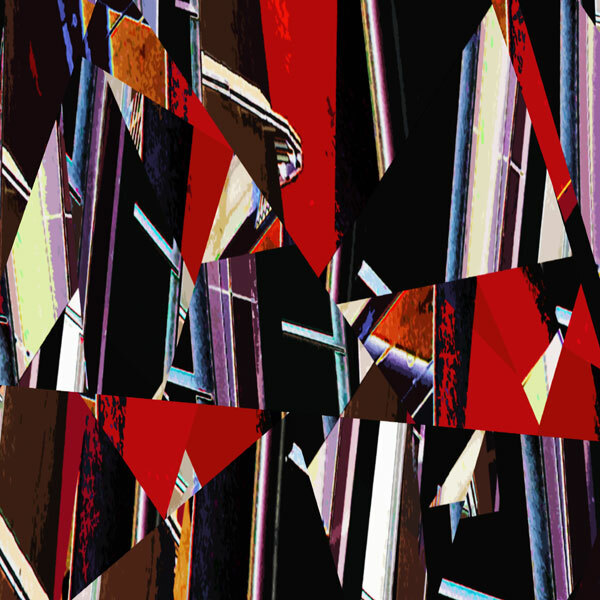 This abstract is from photographs of the red primer painted and galvanised steels of an apartment block under construction as part of local redevelopment. St Peter's Basin to the east of Newcastle city centre has been redeveloped from earlier industrial use to provide housing around a marina. The majority of the boats it shelters are in blandly white or plain coloured fibreglass and plastic but some older ones are of painted wood. 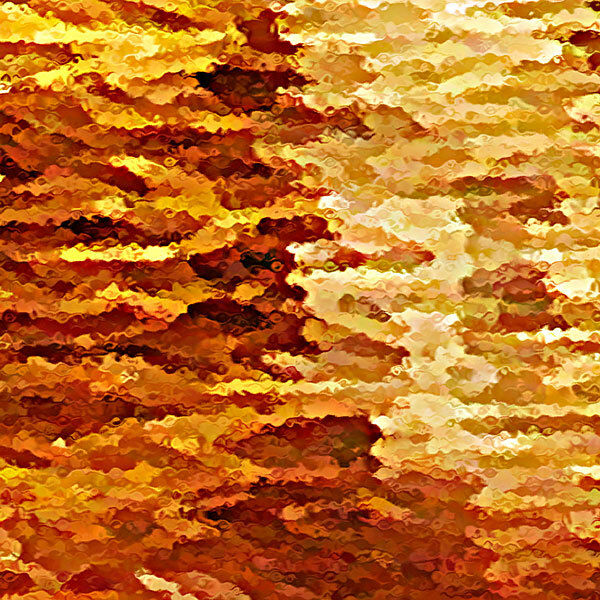 This image is based on water reflections of two former fishing boats recently restored in all their lined-out and lettered glory. 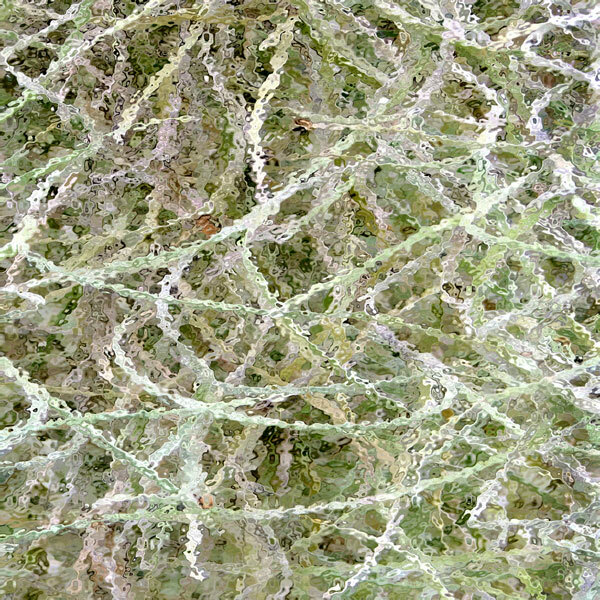 This image is based on a photograph of trailing tree moss growing in the conservatory in Aberdeen Botanic Gardens. 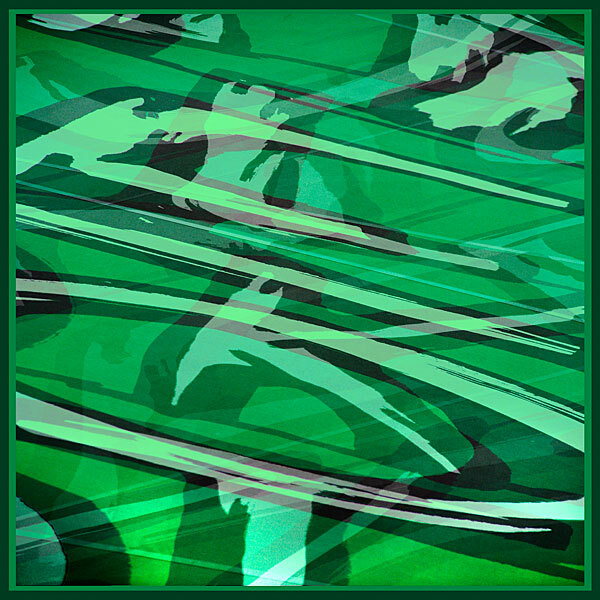 The image combines the slender convoluted strands of the moss and the quality of glass and how it may distort what we see. On a number of riverside walks between Newcastle and North Shields I passed a relatively new workshop with corrugated iron on one of its gables. 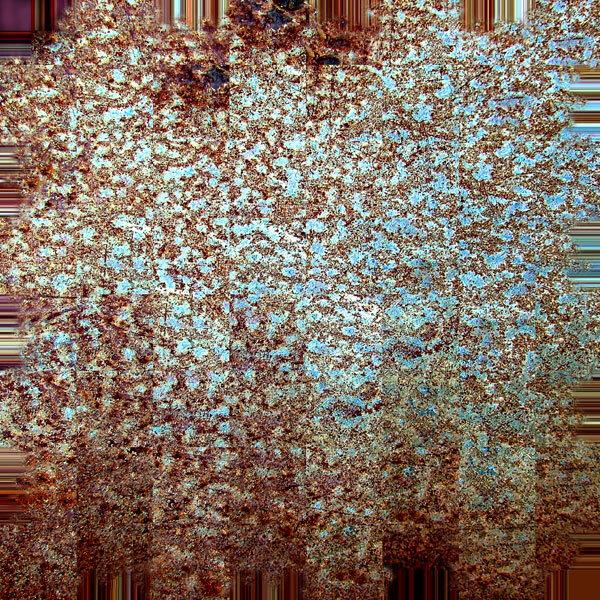 This slightly altered image is quite close to the original subject, with rust having usurped most of the grey-blue zinc galvanised coating. I was also struck by the subtlety of the red variations revealed by the low sun from the right. 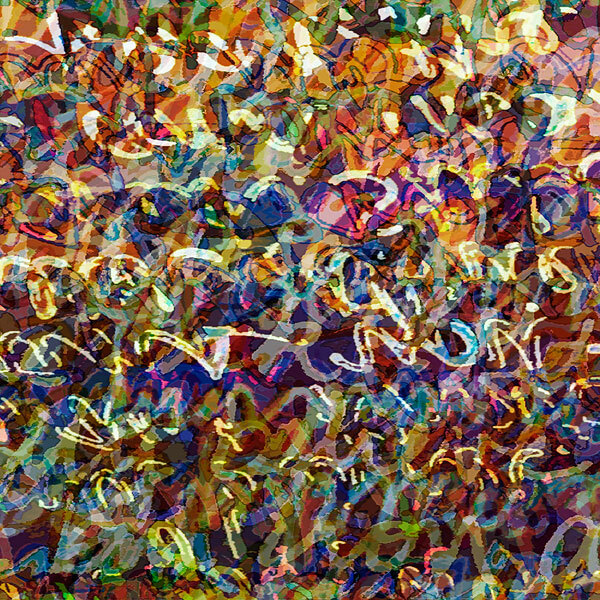 This is another variation evolved from the same source as the previous image, doubtless influenced by a very long fascination with abstract expressionism. Sailing across Elliott Bay to dock in Seattle at night one is dazzled by light from the long spine of high buildings in downtown and the others ranged below them on steep slopes to the waterfront. 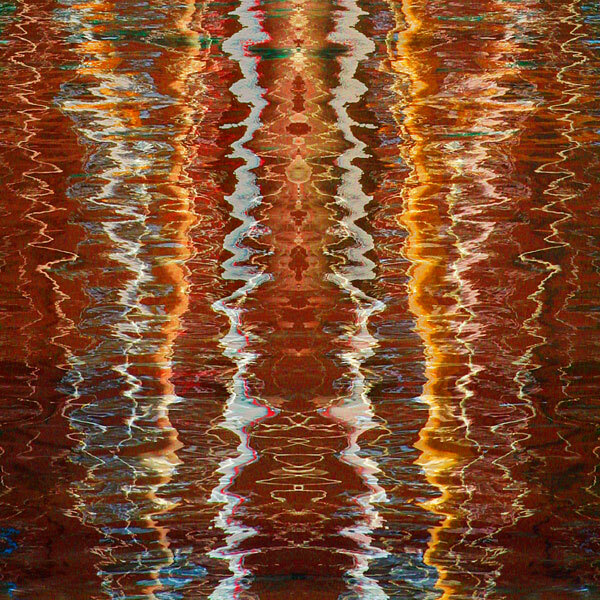 Reflections on the moving water surface are a mirrored distortion of reality, one from which this image is taken. On several walks along the south bank of the River Tyne between Pelaw and South Shields I walked round a fair number of piles of fly-tipped rubbish. Most were earth, building debris, domestic items and the like, but one was a mound of brightly coloured plastic beading. Fairly unremarkable as a straight photograph, simple stylisation and a little colour saturation created a number of images. 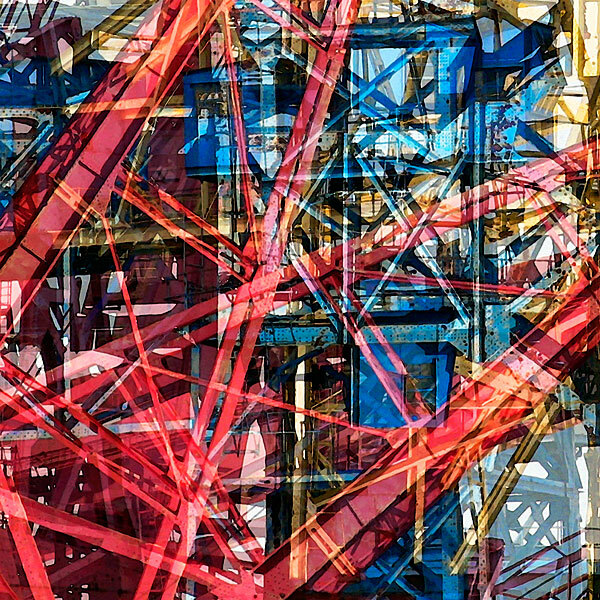 15 ABSTRACTION 2 | Swan Hunter Shipyard. The Swan Hunter & Wigham Richardson yard in Wallsend launched the Mauretania for the Cunard line in 1906: the steam turbine ship held the Atlantic Blue Riband for 20 of its 29 service years. In 2010 the last of the dismantled cranes and machinery in the yard has been shipped to India by shipbuilder Bharati Shipyard. This image is a collage of details from crane photographs. The Tanfield Railway, 1725, in County Durham is the world's oldest operating rail system and is part of a once dense network of industrial waggonways and rail lines in northeast England. The red metal warning discs and white paintwork of the level crossing gates on the road leading to the Causey Arch underpin this composition. Ralph Wood's structure, 1725-6, is the world's first stone railway bridge. The Tanfield Railway has a large collection of small industrial locomotives in running order or awaiting resurrection. Most of the restoration, maintenance and operation is undertaken by volunteers. 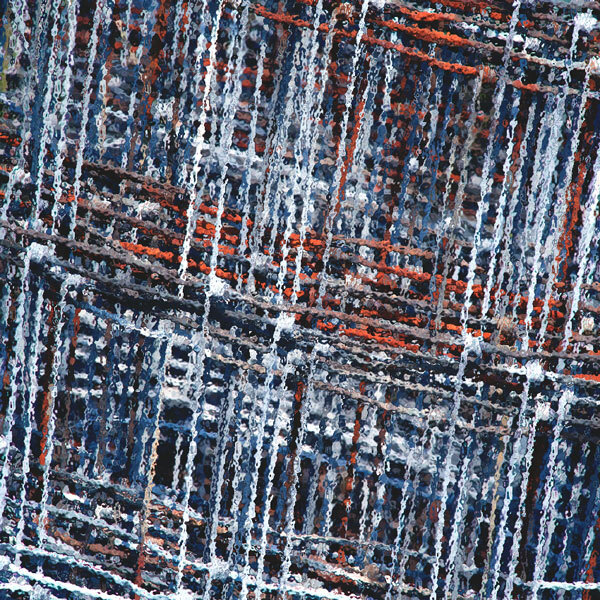 This image is from a roll of four-inch galvanised wire mesh standing in the locomotive yard. The TANFIELD RAILWAY galleries contain primary photographs. 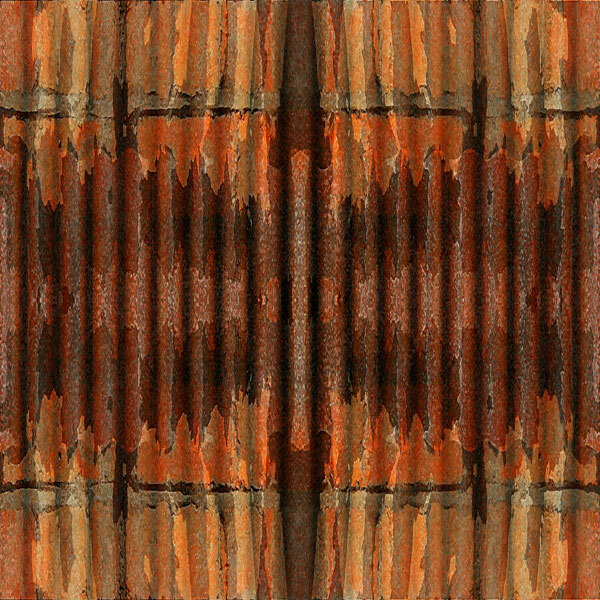 This quartered abstract is based on a small detail of rusting steel buffers at the end of a wagon siding at the railway.